Discussion in 'Music Corner' started by HominyRhodes, Oct 15, 2018. Long-awaited by yours truly, this new book by Nashville music writer Daryl Sanders was published on October 2nd, and it comes very, very close to meeting my expectations -- at a little over two hundred pages, it's shorter than I would've liked, but I'm sure that most Dylan fans who consider themselves well-versed in the *Blonde* story (BoB-Tales?) will find that it offers a lot of new, often revelatory, information. To my mind, the author's approach is that of a "Dylanographer," as opposed to a "Dylanologist." Sanders applies his top-notch journalistic fact-finding skills, utilizes material from dozens of interviews with the key figures in the story, and offers some illuminating new insights into Dylan's musical explorations and lyrical achievements, but he stays entirely out of the way himself, and allows the narrative to unfold without any intrusive self-references, derisive or caustic commentary, or an overabundance of 'deep thoughts' about where Dylan's 'head was at' in early 1966 -- thankfully, he's content to leave those angles to the "Dylanologists," the people whom I always associate with microscopes, test tubes, psychiatrist's couches, and brain wave analysis machinery, when they're not reading tea leaves or studying astrology charts to interpret the meanings and messages in Dylan's works, or obsessing over his personal life. Daryl Sanders simply dug into the fascinating story of how this particular landmark collection of songs came about, and the impact it's had on music and popular culture ever since, and he tells us what he found. His style is very straightforward, easy to follow and comprehend, and he doesn't go off on any tangents, which is always a plus for me. - As previously mentioned elsewhere by @Percy Song, one controversy, about the recording of "Visions of Johanna" on Feb. 14, 1966, now seems to have been settled -- Sanders reveals that the lead guitar part on the track was played by Jerry Kennedy; previous candidates included Robbie Robertson (who, it turns out, wasn't even in Nashville for those sessions, a fact confirmed by RR in his own book, Testimony) or Wayne Moss, who actually plays rhythm guitar on the recording; my own personal scenario had Charlie McCoy trying to play acoustic lead guitar on the first few takes, similar to his majestic picking on "Desolation Row" during the Highway 61 sessions, but then switching over to electric guitar for the final take. Based on information from sessionographer Michael Krogsgaard, and the Cutting Edge liner notes, it was assumed that Jerry Kennedy showed up later that night for the raucous "Pillbox Hat With Doorbell" session, but AFAIK, he's never been previously mentioned as the guitarist on "VOJ." A quick listen to some of JK's other session work from the mid-'60s leaves little doubt that it's him. I'd love to hear any other opinions on this topic. Courtesy of @asdf35 -- who found this track on YT: "Cry Cry Cry" -- an example of Jerry Kennedy's bluesy picking, from an album released in 1965. BTW: Sanders dismisses the notion that an additional overdub session for "4th Time Around" with Charlie McCoy and Kenny Buttrey was held, but he doesn't elaborate or give any explanation for the altered mixes. For now, I'm sticking with Roger Ford's assessment of the issue on his Electric Dylan site. - Supercilious nit-pickery: the 'slow' celeste version of "Can You Please Crawl Out Your Window?" mistakenly released on early pressings of the "Positively 4th Street" single in September 1965 was on the A-side of the 45, not the B-side ("From A Buick 6"), as the author states. I felt compelled to correct that minor, wholly insignificant factoid -- sorry, Daryl S., I'll never mention it again. - Really a sidebar to the main story, but...according to the book (page 76), the Simon & Garfunkel session produced by Bob Johnston in December 1965 that gave the world "I Am A Rock," "Richard Cory" and "Homeward Bound" was held at the Columbia studios in Nashville, and not in NYC. Is that correct? (I've always been led to believe that S&G's first Nashville session actually took place in March of 1966, and resulted in only one released track, "Flowers Never Bend With the Rainfall.") I really feel like I'm missing something here -- did the Dec. 65 S&G session feature NYC musicians, or did Johnston import some of the Nashville Cats up there to play? I'm confused and would sure love to know the true facts of the matter. Also: Daryl Sanders has at least two public book-signings scheduled over the weeks to come, both of them in Tennessee. Details on the publishers website linked above. Generation42, Psychedelic Good Trip, Paulo Alm and 25 others like this. On my first pre-note taking run-through I had the impression that Daryl had been given access to additional banter from the sessions but now I'm not so sure that is the case. It may be that I got the impression because he was giving names to the voices. To verify, I'll have to listen to the "Blonde on Blonde" section of Big Blue all over again. What punishment this is! I also had the impression that he had got hold of some studio paperwork that we were unaware of, but a quick cross-checking with Krogsgaard's notes indicate that he has sifted through MK plus the notes in Big Blue and the memories of his interviewees. As far as I know, MK did have access to the studio logs and they later went missing. It's something of a blessing that MK did the research when he did or we'd have nothing. I'll be reading the book again and making notes this time so don't go away...!! Richard--W, IronWaffle, shadow blaster and 5 others like this. Always thought it was Robertson. Joey_Corleone and asdf35 like this. I'm not sure it's certain that Bob and the Hawks played a concert on 05 December, 1965 at the San Francisco Masonic Memorial Auditorium after completing the two Berkeley shows on 03 and 04 December. There are no contemporary flyers announcing the show and as far as I'm aware there is no review or set list. 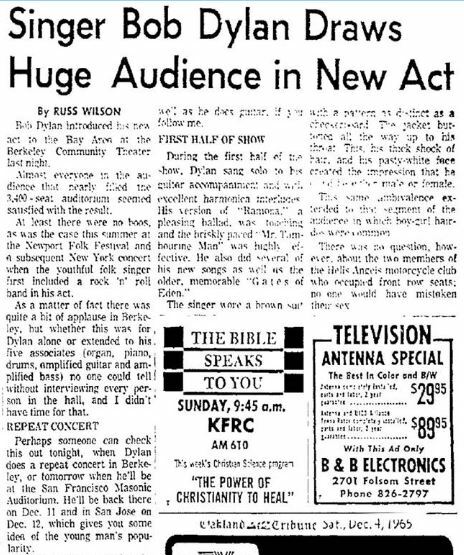 It is mentioned as happening "tomorrow" in this newspaper review of the 03 December Berkeley show, though. antiqueguy19001, Richard--W and HominyRhodes like this. 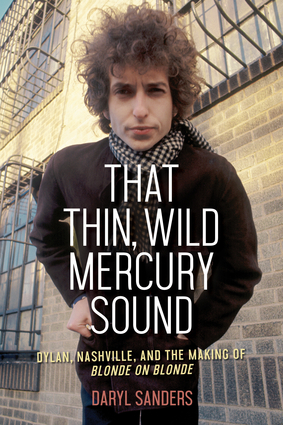 "Legendary Nashville Session Musicians Spotlighted in New Dylan Book by Daryl Sanders"
trumpet sounds and HominyRhodes like this. Thanks, interesting. Sorry @HominyRhodes but are you saying Sanders claims that the June 16, 1966, overdub session for 4th Time Around did not happen? I'll jump in here if that's OK with you and @HominyRhodes . Daryl reports that the LP was released on 20 June. He also reports that Charlie McCoy says the overdub session featuring him on harpsichord and Ken Buttrey on drums never happened. Daryl buys this recollection (or non-recollection) from Charlie because "....there certainly was no harpsichord on "Fourth Time Around", and in any case they wouldn't have been able to meet the release date of 20 June if they were still working on the album on 16 June. In the first instance, I'd posit that the LP probably came out several weeks later than 20 June, some say mid-July is most likely, although it still seems that no one really knows for sure. Secondly, Michael Krogsgaard saw studio logs for the overdub session on 16 June. This stated there were three incomplete takes and one complete take of "Fourth Time Around" featuring Charlie and Ken, with Bob Johnston producing. I think most of us trust MK implicitly to report accurately what he was shown. It's true that the overdubs do not appear on Big Blue, though. Thirdly, there is an image of studio paperwork (Talent Payments) featured in "Medium Blue" indicating that Charlie was paid $185 for a session on 16 June. It isn't absolutely watertight evidence for an overdub session on 16 June, but I'm inclined strongly to believe there was one and that Charlie can't remember it. IronWaffle, RayS, Electric Sydney and 2 others like this. That pesky cymbal still bothers me, though.. Regarding the tone of Jerry Kennedy's hollow-body Gibson ES-335 vs. Robbie Robertson's solid-body Fender Telecaster: hollow-bodies generally have a more well-rounded, full-bodied sound, with natural qualities of sustain and reverberation, although by switching the pickup a more trebly output is easily attainable. Solid-body electric guitars have virtually no natural reverberation, but they generally have more bite, with fewer feedback problems, and can produce a wide variety of stylistic sounds, from twangy chicken-pickin' and vibrato-laden surf to screaming heavy metal. I'm still familiarizing myself with Jerry Kennedy's guitar work, but to me, two tracks in Blonde on Blonde, "Obviously 5 Believers" and "Leopard-Skin Pillbox Hat," feature Robbie's unmistakable stinging, bluesy lead guitar. Daryl Sanders says that Robbie also played on "Absolutely Sweet Marie," "Pledging My Time," "Most Likely You Go Your Way," and "Temporary Like Achilles" during the March '66 sessions, but that he sat out "Just Like A Woman," "Rainy Day Women" (DS says RR had gone to the musicians lounge to get a pack of smokes while that lunacy was being recorded) and "I Want You." As to whether or not Sanders' assessment is entirely correct, I don't know. Your impression that he may have simply combined Krogsgaard's work with the Cutting Edge liner notes and then ran it all past the surviving session players to see what they remembered could be correct. Unfortunately, Charlie McCoy and the rest of the boys played on hundreds of recording sessions back in the '60s, and you wonder how good their memories could possibly be. In an interview somewhere along the line, I remember Jerry Kennedy saying (to paraphrase) that if they knew people would still be interested in this stuff so many years later, they would have kept better records. Yeah, that would have been nice. Richard--W, IronWaffle, notesfrom and 4 others like this. I agree with Percy Song -- there had to have been a later overdub session. No other explanation makes sense. Richard--W and shadow blaster like this. Hello, Daryl Sanders here. I ran across this thread about my book and would be happy to try to address some of the questions herein as I have time to do so. I'll start with the lead guitar fills on "Visions of Johanna." I knew it wasn't Robbie Robertson because I had conclusive evidence from multiple sources he wasn't present when the song was recorded in Nashville in February. In the cover story for the Nashville Scene I wrote in 2011, I was mistaken in thinking the lead fills were played by Wayne Moss. It was midnight or later when "Visions of Johanna" was recorded, so both Pig Robbins and Jerry Kennedy were present by then. When I got the 18-CD edition of The Cutting Edge, I enlisted the help of guitarist Mac Gayden to identify who was talking on the takes, as well as which guitarists were on which tracks. From the sound of the guitar, Gayden knew the fills were played on a Gibson 335, not a Fender Jazzmaster, so that ruled out Moss, whose electric axe at the time was a Jazzmaster. Jerry Kennedy played a Gibson 335 in those days, and the only other guitarist on the Blonde on Blonde sessions who played a 335 was Gayden. Gayden knew that he had not played the fills, so he thought it was Kennedy. I sent the relevant take(s) to Jerry, and after listening to them, he concluded it was him because it sounded like the sound he was getting with the 335 and the amp he was using at the time, and the actual playing sounded like his playing at that point in his career. Jerry did also play on the takes of "Leopard-skin Pill-box Hat" recorded after "Visions of Johanna." FYI, although he certainly played some electric guitar on sessions over the years, Charlie McCoy only played acoustic guitar on Blonde on Blonde. Linto, JohnKale, trumpet sounds and 29 others like this. Thanks for this! I've been obsessed with "Blonde On Blonde" since I bought my mono copy in the summer of 1966 and I enjoyed your book, Daryl. SteveFff and Daryl Sanders like this. Terrific to have you here, Daryl, and thank you for the additional priceless information! I do hope you'll stick around as further comments come in. @HominyRhodes and I have been discussing "Blonde on Blonde" for years and a book about its recording has been on our respective wish lists for even longer. Yours fits the bill nicely! Have you read the "The Cutting Edge" essays that Roger Ford wrote for Isis Magazine? Were you able to discover what might have happened to the original studio logs? My understanding is they went "missing", but it must have been relatively recently because Krogsgaard certainly had access to them when he compiled his Recording Sessions project. JohnKale, Richard--W, SteveFff and 5 others like this. Thank you! Great detailed info on how you researched this. JohnKale, SteveFff, Daryl Sanders and 1 other person like this. We really appreciate seeing you here, Daryl. Your work has never gone unnoticed by the Dylan fans around here, and we thank you for putting out a book devoted exclusively to Blonde on Blonde. I hope it does well, and I'm considering buying a second copy so that I can scribble some notes in it. I have a million questions running through my brain at the moment, but now that you've given us some more details about your assessment of the recording of "Visions of Johanna," other long-unresolved issues about the released version of "4th Time Around," which was also recorded on the first day (or night) of sessions on Feb. 14, 1966, still confuse us -- were the original drums and keyboards wiped from the multi-tracks, and did Charlie McCoy and Kenny Buttrey add new parts during an overdubbing session on June 16th (see graphic posted by @Percy Song above)? According to your book, Charlie McCoy doesn't recall any such session, and you point out that it was probably unfeasible to have substituted the new track if the album was released just four days later, on June 20th. But clearly something was done to "4th Time Around" since the early pressings of the record use the version with the keyboard, and the later ones do not. Roger Ford, one of our favorite Dylan experts, has addressed this topic in great detail, and if you have any other thoughts about it beyond what you've written in the book, we'd love to hear more. Also: through your interviews with him, were you able to determine which tracks Bill Aikins may have played on? As we all know, the studio records from that period are incomplete or in disarray, but he did receive a credit on the album (while Mac Gayden didn't, for some reason!) so I was wondering if he may have played keyboards on that first mix of "4th Time Around." In the book, you say it was Al Kooper playing, using the 'clavichord' voicing (I incorrectly called it a 'clavinet' in an earlier post). Any further thoughts about the personnel/recording/mixing/overdubbing of the track would be most welcome. Thanks again for the additional insights about Jerry Kennedy and "Visions of Johanna." We hope you won't be a stranger here at the SHF, and if you see your friend Mac Gayden, tell him that I think "Everlasting Love" was one of the greatest radio songs of all time. JohnKale, Dok, Richard--W and 7 others like this. Damn, here I was hoping that I wouldn't need this book....but who am I kidding.....I need it. Percy Song, Electric Sydney and HominyRhodes like this. Could someone start a private conversation with me so I can get some guidance on how to reply to specific questions within the thread? I tried to initiate a private conversation with Hominy, but I get an error message that says I don't have permission to do that. Daryl -- I sent you a PM -- see if it works. @Percy Song kindly alerted me that Daryl had joined in this thread about his book, so I thought perhaps it was time I stepped forth from the shadows too. 1. The long-debated issue of the lead guitar on “Visions Of Johanna”. Now that Daryl has revealed just how late recording actually started on that first February date, it seems quite reasonable to assume that Jerry Kennedy was there by the time this song was recorded, despite indications to the contrary in Columbia’s paperwork as reported by Michael K. While to me the lead guitar on the released album track still sounds a little closer to Robbie Robertson’s interjections on the New York recordings than to anything on Jerry Kennedy’s From Nashville to Soulville album, I can see the strong similarities between the two players in both style and guitar tone. So it seems a more elegant solution to accept that yes, it was Jerry Kennedy, even though nobody can exactly recall him playing on that song. To insist that it must have been Robertson, via a conjectured overdub at the March sessions, now seems like an unnecessary conspiracy theory (for which I accept full responsibility ). 3. The release date of the album. I think pretty well everyone now agrees that the initially scheduled date of 16 May was missed by quite a long chalk. That seems to have been replaced by an “official” date of 20 June, and this date is indeed to be found on p.31 of Dylan’s Contract Card, reproduced in the book of the 6-CD The Cutting Edge (behind the third disc). However, it’s possible that that shipping date was also missed due to the last-minute changes being made to the mono edition. 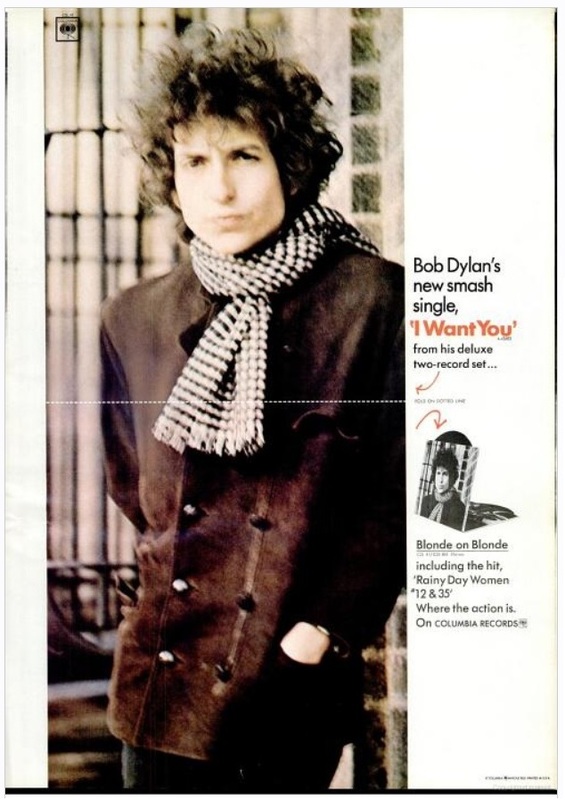 OK, as Daryl says in the book, the album was shown in the full-page ad for “I Want You” two weeks earlier, but that ad was probably booked and prepared before Dylan insisted on the last-minute change to “4th Time Around”; and it was essentially an advert for the already-released single. The album’s first proper mention in Billboard seems to have been in the issue dated 9 July. This would have gone on general sale the previous Saturday, 2 July, and I think the press deadline would have been Thursday 30 June. 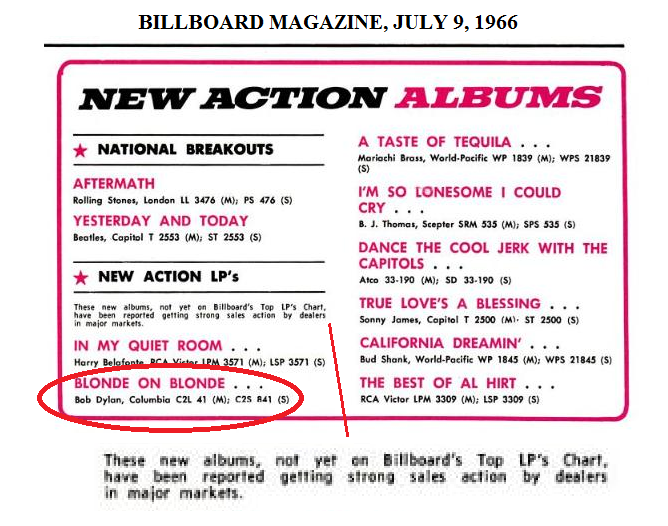 Blonde On Blonde was listed under “NEW ACTION LP’s”: “These new albums, not yet listed on Billboard’s Top LP’s Chart, have been reported getting strong sales action by dealers in major markets.” Unless this is just talking about advance orders, it suggests that the album must have been available at least in ‘major markets’ (i.e. some big cities?) by Monday 27 June – but not necessarily any earlier than that. I think that limited quantities of the mono album could have been shipped by then even following an overdub session on 16 June. Columbia must by this stage have been pulling out all the stops to get the album out. Certainly some people reported not being able to get hold of the album until some way into July, but Columbia were probably struggling to get enough copies pressed to fulfill demand across the country, and prioritised these major markets. Of course I’ll be updating the Electric Dylan site plenty to reflect all that we’re learning from Daryl’s book, but that’s going to take a while. In the meantime, any views on the above? JohnKale, baconbadge, Richard--W and 13 others like this. As you all know, Bill Aikins was credited on the album, and I have interviewed Bill numerous times about not only Blonde on Blonde, but also his time in Charlie McCoy & The Escorts. Although Bill was present that day because Pig Robbins was booked on other sessions earlier in the day and evening, from a thorough examination of all the takes recorded on February 14 I concluded that he didn't actually make it on the album. I didn't feel a need to go out of my way to point that out in the narrative, although it's apparent if you consult the song-by-song musician credits in the appendices of the book. Bill said Al Kooper was on organ and he was on piano, but there is no piano on either "Fourth Time Around" or "Visions of Johanna." There is piano on the 13 takes of "Leopard-skin Pill-box Hat" recorded in the wee hours of February 15, but there is no question Pig was on hand by then, and at one point. Bob Johnston was out in studio and can he heard advising engineer Tom Sparkman that Pig would have a solo. Regarding the clavichord sound on "Fourth Time Around," Al Kooper was definitely in the studio for that because he can be heard talking with Johnston on takes 6-7. Al confirmed that he only played organ on the album, and that corroborates what both Bill and Pig told me, so that was Al. (For the record, I never suggested he used that sound because he couldn't figure out how to turn off the clav sound — I'm not sure where that idea came from, but it wasn't from me.) Al was excited about the various organs at the studio in Nashville, and used several unusual voicings on the album, most notably the blow pipe sound on "I Want You." Bill Aikins remembered playing on "Visions of Johanna," but as I mentioned, there is no piano on the master take, nor on the three earlier takes which were incomplete. My theory on that is Bill may well have been at the grand piano on "Visions of Johanna," but the mic on the piano was turned off in the mix, possibly because Johnston didn't like the part he was playing or didn't think it fit. trumpet sounds, Richard--W, SteveFff and 8 others like this. Thanks for clarifying. I'm sorry that I misinterpreted what you wrote about the keyboard setting that Al Kooper used on "4th Time Around," and your explanation makes total sense. Now I can listen to the track with new ears, so to speak. And I really liked your detailed look at that song's kinship with the Beatles' "Norwegian Wood" -- very well done. The organ brings up the other mystery about "4th Time Around" -- any additional thoughts about how and why the track was altered, and the organ part completely removed? The drum part was also re-recorded at some point, and the altered track was then included on the so-called "revised mix" released sometime later -- any clue as to when those alterations may have been done? JohnKale, Dok, royzak2000 and 4 others like this. You really do need it @shadow blaster . I don't need to wax lyrical about the style, the composition of the book or the information contained therein. @HominyRhodes did all that miles better than I ever could in his opening post. Daryl's book, along with his generously offered additional notes here, is providing information that previously we could only guess at. "On Saturday, Oct. 13, Sanders will join fellow Dylan author Daniel Wolff and author/musician Charlie McCoy for a panel discussion, “The Ballad of Bob: Nashville, Southern Music and Dylan” as part of the Southern Festival of Books." @Daryl Sanders - Was this panel discussion recorded so those of us 4,149 miles from Nashville can hear it or see it? I sure hope so. shadow blaster, Daryl Sanders, oxegen and 1 other person like this. People who really know what they're talking about civilly discussing a really interesting topic - the Internet may implode! davenav, HJY1, antiqueguy19001 and 24 others like this. Wonderful to have you join us, Roger -- thanks for everything. SteveFff, Percy Song, RayS and 2 others like this. Psychedelic Good Trip, antiqueguy19001, JohnKale and 16 others like this.